Pacquiao-Khan: is the wait over? AMIR KHAN is close to announcing a deal to fight superstar Manny Pacquiao on May 20. Former training partners Khan and Pacquiao are understood to have agreed terms to face each other in Britain in what would be one of the most eagerly-anticipated fights of the year. 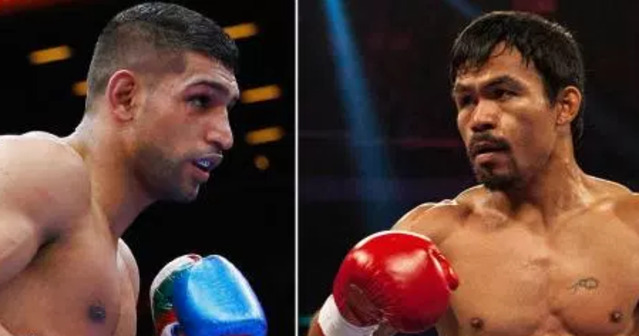 Khan has been pushing for a career defining clash with either Pacquiao or Floyd Mayweather for years and now looks to have finally got his wish. And according to The Times, the pair will go head-to-head later this year with the Manchester Arena or Bolton’s Macron Stadium the venue to host the bout. Khan has not fought since he was knocked out challenging Saul Alvarez for the WBC middleweight title in Las Vegas last May. Since then the 30-year-old has taken time off to recover from an operation to repair a damaged hand – which Khan revealed to The Sun meant he had been fighting with a broken bone for 13 years. But after looking for a high profile match to greet his return top the ring, it seems he may have come up trumps with a bout against the popular Filipino. Talks took place with promoter Eddie Hearn over a huge all-British clash with Kell Brook but no deal could be agreed amid claims Khan was holding out for too much money. Now it seems the former world light-welterweight champion will get the A-list opponent he has been searching for in the shape of Pacquiao. Verbal agreements have been reached between both camps, with just official contracts now needing to be signed. And though at 38 Pacquaio is no longer at the peak of his powers, he is still regarded as one of the sport’s biggest names and getting him to fight in the UK will be a huge attraction to British boxing fans. He has been crowned world champion across eight divisions and is regarded as one of the greatest fighters boxing has ever seen. Last November he was crowned WBO welterweight champion when he cruised to a comfortable unanimous decision to beat Jessi Vargas in Vegas. Khan and Pacquiao know each other well after their time working together under Freddie Roach in Hollywood, when they sparred hundreds of rounds together. At the time Roach insisted they would not fight each other, but Khan’s switch to work under Virgil Hunter in 2012 has made the bout possible.